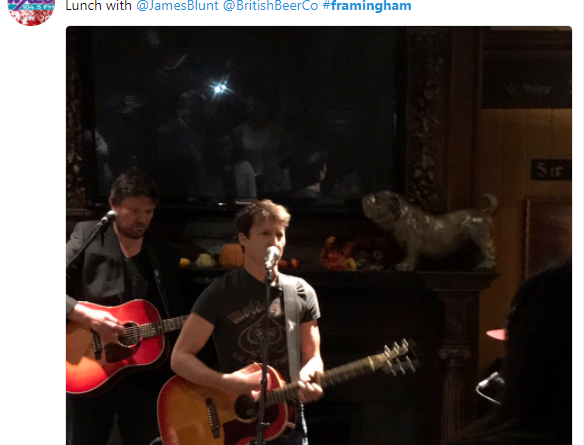 FRAMINGHAM – Singer-songwriter James Blunt was in Framingham today, Sept. 22. Best known for his mega hit You’re Beautiful, the singer performed at the British Beer Company this afternoon, as part of a radio promotion for WXLO, out of Worcester. The 43-year-old singer, has sold more than 20 million record worldwide. He has been nominated for a Grammy award five times, and won two Brit Awards, including best British Male singer in 2006. He also has won two MTV Music awards. Blunt performed a private show for winners of the radio’s contest, and then there was a meet and greet awardwards. This is not the first time the Worcester radio show has brought a musician to the British Beer Company for a concert. Duran Duran performed as part of a WXLO contest in October 2011.